When Ted prevents the depressed priest Father Kevin from jumping to his death at the "It's Great Being a Priest Conference", he catches the eye of American priest, Father Buzz Cagney. Buzz asks him if he would like to come to a parish in Los Angeles. Ted is incredibly excited by his offer from Father Buzz Cagney and believes that he will be able to finally escape from his awful existence on Craggy Island. When he tells Father Dougal, Father Jack and Mrs Doyle about his offer, they all get the wrong end of the stick and believe that they will all be going with him. 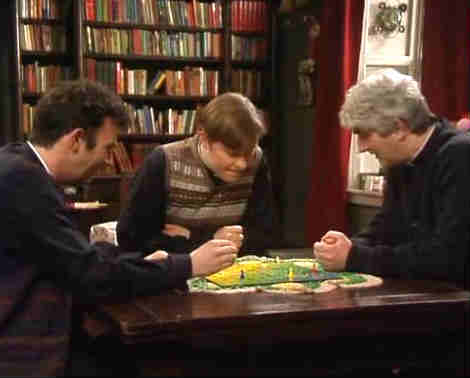 Ted doesn't have the heart to tell the members of his parochial house that they will be staying at Craggy Island. They all end up at the airport ready to fly out while Ted hops on the plane. While on the plane, Buzz tells Ted of the gang culture around his new parish, and the general fear of getting shot dead motivates Ted to getting off the plane and rejoining Mrs Doyle, Jack and Dougal. Finding out that they weren't all that bothered about going to America anyway, Ted and the gang return to the parochial house. Ted resigns himself to the fact that he will probably never escape Craggy Island. Father Buzz Cagney: I know they're gonna love ya in the States, Ted. You put on a show! But remember, it's a competitive market! You'll be up against Billy Graham and those Nation of Islam guys! You gotta get your own inch, you gotta grab 'em! You know where to grab 'em? Father Ted: Yeah, by the balls! Mrs. Doyle: I got someone to come around and take away all the furniture and burn it in a big fire! Dougal tans really badly no matter where he goes on holiday. Ted imagines Dougal as a puppy dog, Mrs Doyle as a school-girl, and Jack as a crooner in a rocking-chair singing I'll be seeing you in apple blossom time. Protective helmets are worn in the parochial house when Jack has his nails cut by Mrs Doyle. Father Kevin's depression is cured by listening to the Theme from Shaft by Isaac Hayes. He falls into depression again after listening to Exit Music by Radiohead. Jack adds the phrase Big bras to his vocabulary. Dermot Morgan died from a heart attack the very next day after finishing filming this episode. The credits are replaced by a montage of clips from all 25 episodes. This was always intended to be the final episode of Father Ted as the writers and performers wanted the show to go out on a high.